Today’s review will be about the main character in the Assassin’s Creed series of games, none other than Florence-born Ezio Auditore in his Legendary Assassin garb. 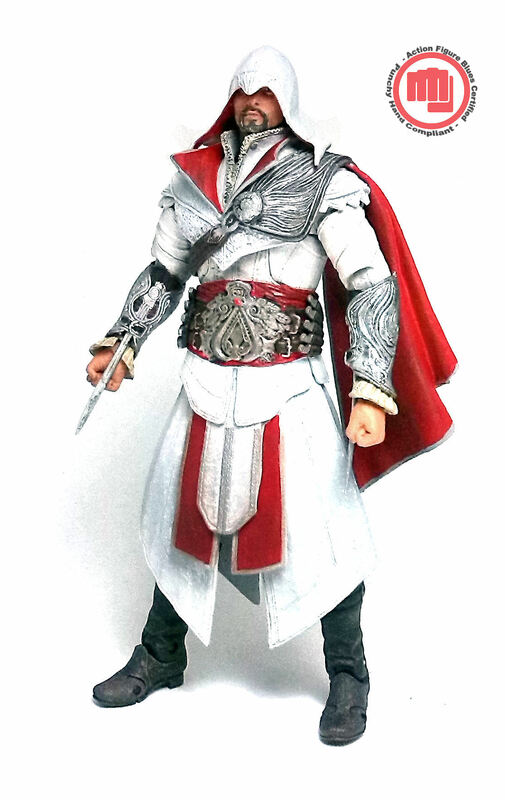 This 8-inch figure of Ezio was released by NECA in their Player Select line and is based on his appearance in the Assassin’s Creed: Brotherhood game. 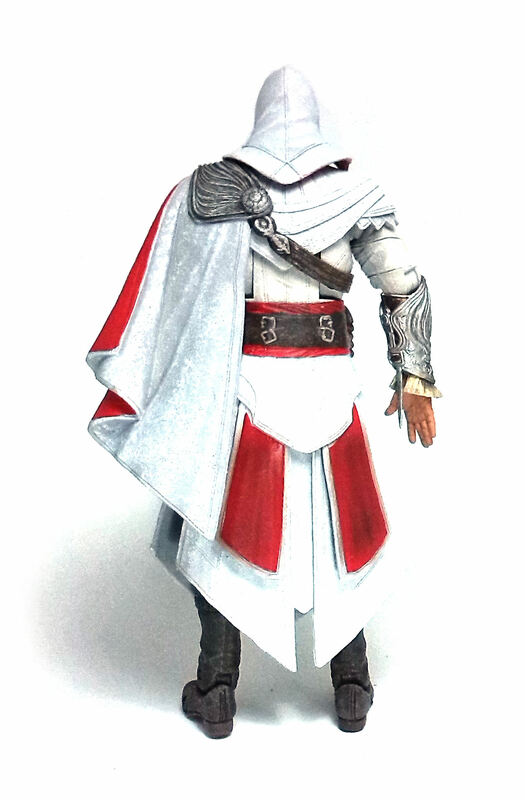 Ezio’s garments consist of a tunic, a short cape with a hood, a tabard, leather pants and heavy riding boots. He also wears a number of protective pieces armor on him in the form of a pauldron for his left shoulder, bracers on both forearms and a wide belt with a lot of buckles and a wide metal plate at the front. The armor pieces are very ornate, full of engraved textures. By comparison the cloth items seem slightly less elaborate, but still display a good amount sculpted details like embroidery and natural-looking folds and creases. The overall effect is that of several layers of fairly heavy garments, so I was rather curious about how this would affect the figure’s poseability, flaunted to be over 38 points of articulation in the package. 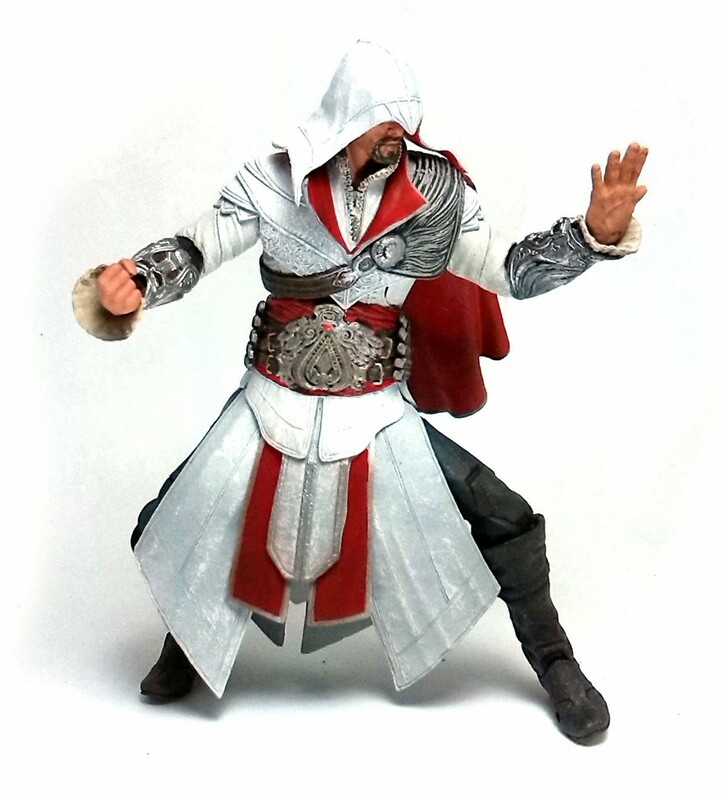 Ezio turned out to have a very good amount of stability, and even on some of the less static poses I found that the rubber skirt flaps help quite a bit to keep him upright. The paint job on Ezio is very nice, consisting mostly on solid blocks of red and white with very discrete shading applied to enhance the textures. The armored bit are decorated in a tarnished silver finish, with most of the leather apparel painted in a plain dark brown hue with some weathering simulated by drybrushing with a dusty gray color. 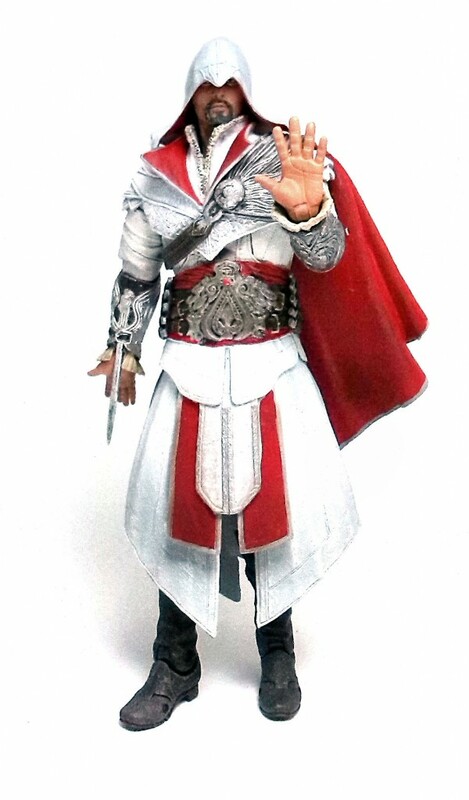 Ezio’s face is also nicely painted, despite being mostly covered by the hood. The portrait is that of a young male with a short beard and mediterranean appearance. The skin tone of the face is warm and matches the color of the hands. 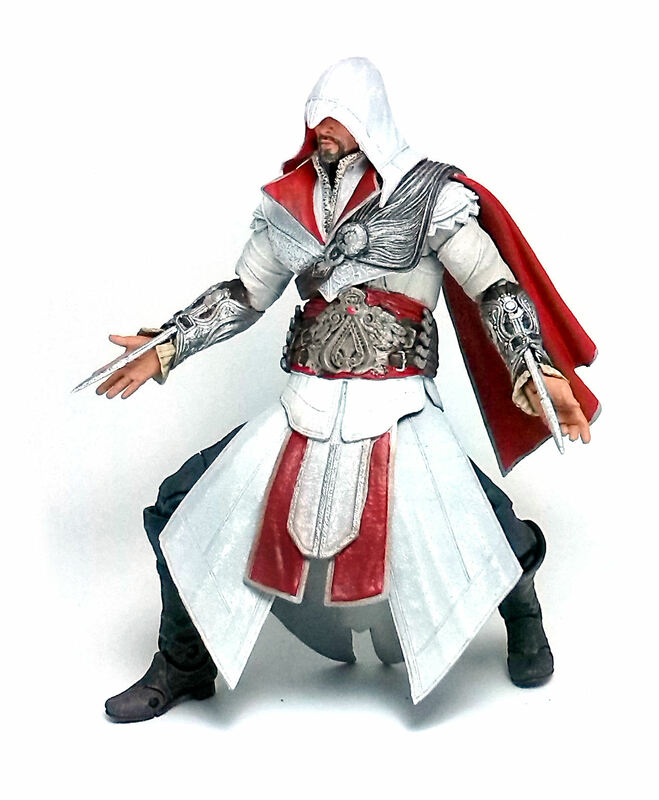 And incidentally, Ezio comes with three different sets of them. These are a couple of open palms, fingers outstretched, a pair apt to grab some other accessories and the default set of AFB Compliant punchy hands the figure has right out of the package. As for weapons, Ezio comes only with a couple of concealed blades that can slide in and out of the inner face of his bracers. 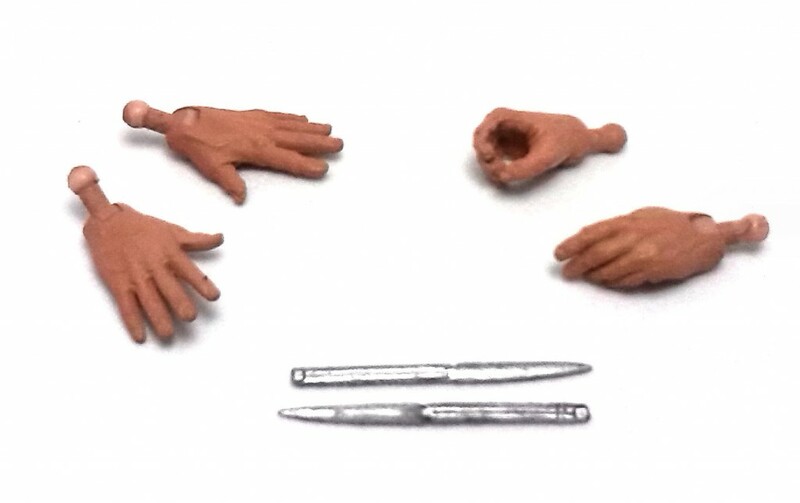 These are very thin pieces of cutlery that can be removed to facilitate exchanging the hands, but just don’t look too formidable as weapons. On the whole, I am quite pleased with Legendary Assassin Ezio. The figure is superbly detailed and very fun to mess around with, despite the limits to his articulation imposed by the costume design.